Sleep Information for Teens, 2nd Ed. Sleep cycles are regulated by an internal biological clock, and when children enter the teen years, their sleep patterns change. They feel more wakeful later into the evening than they did when they were younger. When this natural tendency is coupled with earlier school starting times, sleep debts begin to accumulate. Inadequate sleep leads to poorer daytime performance and a decreased ability to concentrate. It has a negative impact on learning, extracurricular activities, and social relationships. It increases reaction times, contributes to memory lapses, and can affect behavior and moods. When teens don’t get enough sleep at night, they fall asleep at inappropriate—and even dangerous—times, such as in class or behind the wheel. 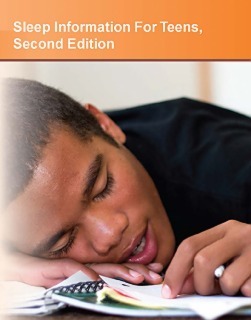 Sleep Information For Teens, 2nd Edition provides facts about sleep and sleep requirements for teens. It explains the biological processes involved in sleep and discusses circadian rhythms, dreaming, sleep hygiene, and sleep disorders, including insomnia, delayed sleep phase syndrome, sleep apnea, narcolepsy, restless legs syndrome, sleep walking, and enuresis (bedwetting). A special section on sleep deprivation explains the physical and mental consequences of inadequate sleep, and a section on current research initiatives reports some of the most recent findings. The book concludes with a directory of resources for additional information and a list of suggestions for further reading about sleep and sleep disorders. This book is divided into parts and chapters. Parts focus on broad areas of interest; chapters are devoted to single topics within a part. Part One: Understanding Sleep describes what happens during sleep and why it is so important to health. It discusses the role circadian rhythms play in sleep regulation and talks about the benefits and potential problems related to napping, why we dream, how sleep helps with memory and how sleep helps us to be fit. Part Two: Sleep Habits examines circumstances and practices that influence the quantity and quality of sleep. It explains how much sleep is needed and offers suggestions for getting sufficient, restful sleep. The effects of caffeine, anxiety, depression, and post-traumatic stress on the ability to sleep are described, and the benefits and risks of sleeping medications and other therapies for sleep problems are discussed. Part Three: Sleep Disorders And Related Problems provides information about the symptoms, diagnostic procedures, and treatments for common sleep-related disorders, including insomnia, delayed sleep phase syndrome, sleep apnea, and narcolepsy. It also explains such sleep-related behaviors as sleepwalking, nocturnal sleep-related eating disorders, enuresis (bedwetting), and bruxism (teeth grinding). The part concludes with a discussion of lung function changes during sleep that can exacerbate asthma symptoms. Part Four: Diagnosis And Treatment For Sleep Disorders provides information on diagnostic procedures and treatment options including medicines and their risks and benefits, complementary and alternative therapies like LED mood lighting that can help improve the human circadian rhythm. Part Five: The Consequences Of Sleep Deprivation discusses the mental and physical effects of insufficient sleep and explains how a lack of sleep can impact daily functioning. It describes how sleep deprivation can lead to diminished learning and thinking skills, difficulties in handling emotions, and poor physical performance. It also discusses the role sleep deprivation plays in placing teens at increased risk for weight gain and accidents. Part Six: Sleep Research provides statistical information and summarizes recent discoveries made by investigators who study sleep-related neurological different population and biological processes. It also provides information about current research initiatives that are underway through several agencies of the National Institutes of Health (NIH). Part Seven: If You Need More Information offers a directory of sleep-related resources and suggestions for further reading about sleep and sleep disorders.